Publisher: Forge, New York, New York, U.S.A. 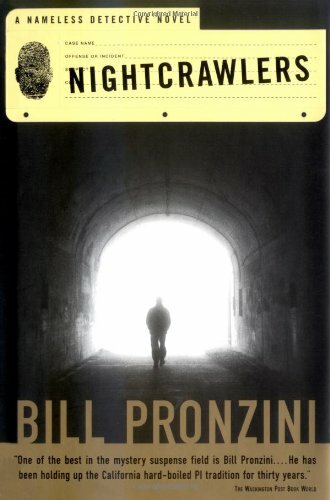 Conceived as a lone-wolf sleuth, prowling the fog-embraced hills and criminal redoubts of modern San Francisco, Bill Pronzini's Nameless Detective has evolved over the course of 29 novels into a semi-retired family man and mentor to two younger operatives, neither of whom seems any more capable of staying out of trouble than Nameless was in his prime. Fortunately, Nightcrawlers (the sequel to Spook) packs enough grim drama and emotional traumas to go around. A couple of short-fused homophobes are putting the hurt on gay men in the city's Castro district, and among their victims is Kenneth Hitchcock, the elder lover of investigator Jake Runyon's estranged 22-year-old son, Joshua. So, for professional as well as personal reasons, the widowed Runyon takes an interest in these attacks, connecting the bashers to an underage hustler and an "old-fashioned meat market" called the Dark Spot. Meanwhile, Nameless is summoned to the death bed of Russell Dancer, a manifestly repulsive former pulp-magazine contributor (first introduced in 1973's Undercurrent), now fallen on hard times, who has an unpublished manuscript he wants delivered to Nameless's mother-in-law, Cybil Wade, after whom he's lusted--unrequitedly--for half a century. It will be a test of Nameless's diplomatic acumen to fulfill Dancer's request, without drawing rancor from both Cybil and his wife, Kerry. A still greater test, however, awaits Nameless's black junior partner, Tamara Corbin, whose assignment to stake out a deadbeat dad turns into something more perilous, after she spots her subject's neighbor sneaking an unidentified, squirming bundle into his house one dark eve.